Stop the presses! I found another thing to upset myself with at the drop of a hat. I don’t watch horror films, but I give myself other kinds of “safe terror” just the same. Instead of watching a movie with actors torturing each other, or CGI monsters looking fake but scary, I typically just image search things that I don’t care to see. Sometimes, I do this for hours. My tale begins with basking sharks. I have worried over the size of them and their tremendously huge mouths for years now. They don’t have teeth, but they don’t need teeth! 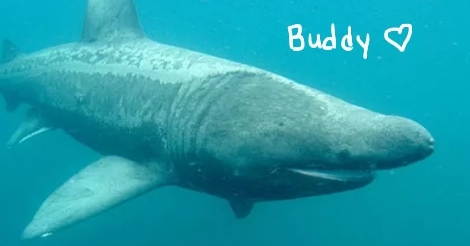 I see video footage of people in sea kayaks with basking sharks gliding along next to them, and what if they fell in? Would you get caught in the back of its mouth? Stuck in a gill? Would it cough you up? Can sharks cough? Halp! This led me to scare myself imagining even being in a sea kayak. Nightmare beyond all capacity for imagination! I would be sitting there, petrified, a four alarm panic surging through me — and that’s if the sea was calm and I saw NOTHING out there. 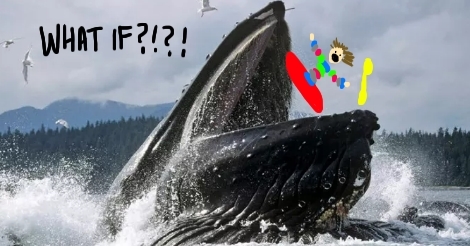 The entire time, I would just be imagining a huge mouth streaming upwards, ready to engulf me like the video footage I have seen of whales breaching without realizing that there is a human in a kayak, unaware of the danger. Oh terror. 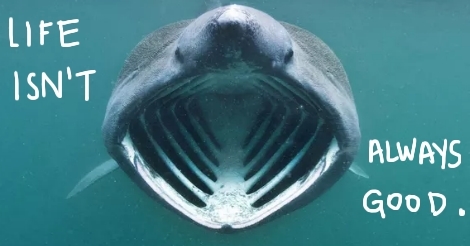 So I started searching various things with the words “with huge mouth.” There was plenty to jolt me unpleasantly, although the basking shark was still the one that would give me the most severe pang of mortal fear. Even the gaping toothy maw of a giant great white shark doesn’t scare me as much. In fact, if forced to choose, I would probably go into the mouth of a great white shark because then it would all be over so much sooner. 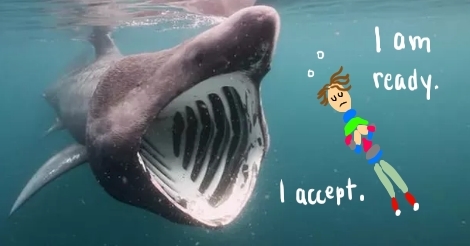 Some things would be worse than death, and that includes the uncertainty of what is going to happen once you are caught in a basking shark’s mouth. 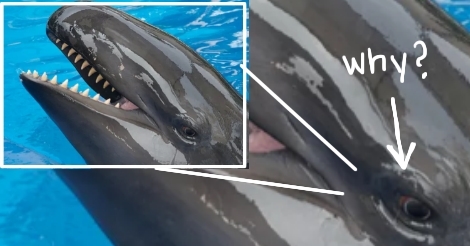 Well, that is what I thought until I saw the face of a false killer whale. I would find the nearest basking shark and fling myself into its mouth. I think it looks very sly and dishonest. I know I shouldn’t place human traits onto an entire species of animal, but that right there is a whale I would not trust. 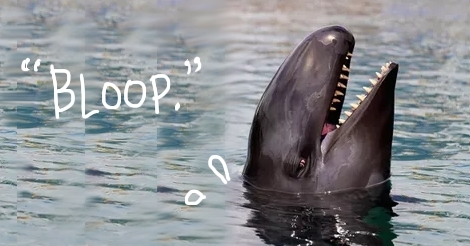 Also it is a false killer whale, so not only is it a murderer, but it is a liar, too. They are twenty feet long and look at its teeth and look at what its eye is conveying. I think you’d be LUCKY if it only killed you. I suppose my silver lining of this terrible discovery and damage to my psyche is that now I don’t fear basking sharks as much as I used to. They have one awful, upsetting feature, and they’re really big, but they don’t seem malevolent. They actually seem to be big sweeties and not at all a threat. They won’t steal your credit card and your identity, torture you, then dispose of your body disgracefully. They would probably just bump into you and then shy away. There are much worse things in the sea. Also, look at how cute they are when they keep their mouths shut. Basking sharks, I love you now. And I am sorry about before.